Capitol Land Trust was recently awarded funding for two new projects through Thurston County’s Conservation Futures program. We were awarded $600,000 for the Darlin Creek project. The trust plans to acquire 312-acres along Darlin and Dempsey creeks near Capitol State Forest for restoration and conservation of wildlife habitat and wetlands along the Black River, including habitat for the endangered Oregon spotted frog. 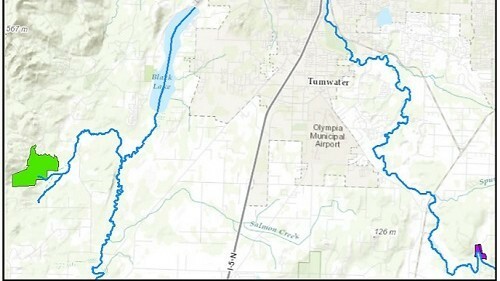 Capitol Land Trust also was awarded $122,500 to help fund the purchase of the Shermer property, 21-acres of river floodplain and wetland that connect with the Deschutes River during high flows. The purchase of the land allows for future habitat restoration for Deschutes River salmon.